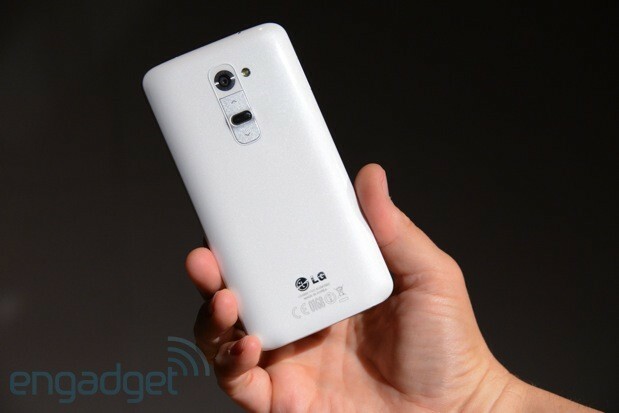 We've just met the follow-up to LG's Optimus G flagship, the much-anticipated LG G2. That "much anticipated" comes with a caveat, though: while there's plenty to love about LG's recent premium handsets, they haven't achieved anywhere near the same market clout as, say, Samsung and HTC. With the G2 -- correct, no "Optimus" here -- does LG finally have a crowd pleaser on its hands? Let's dive in, shall we? 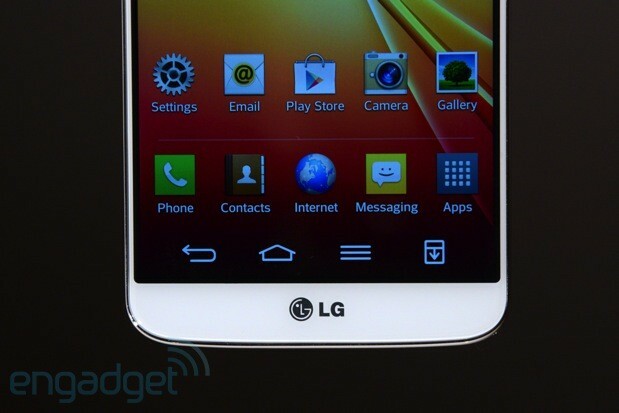 As we mentioned earlier, this is the LG G2 -- no Optimus this time. All previous phones in LG's premium lineup have included the Optimus moniker, but communications director Ken Hong says that naming scheme will be dropped moving forward. The G2 also departs from the Optimus G with its significantly larger screen, going for a 5.2-inch display (versus 4.7-inch on the original). And speaking of that panel size, LG's Ram-chan Woo tells us that "phone sizes have gotten bigger, so the way we grip a phone is slightly different." Brace yourselves for the biggest (albeit expected) design change on the G2: the volume and power buttons sit on the back, directly below the 13-megapixel rear camera module (more on that later). We've all had the experience of accidentally hitting these buttons accidentally when gripping the phone from the upper edges, so this design is pretty intriguing. Of course, the worry is that the buttons will accidentally be activated when the phone is sitting on a flat surface, but LG's dodged that bullet by using curved, slightly indented keys that don't sit flush with the rest of the device. If you're a fan of the LED notification light surrounding the Optimus G Pro's home button and like to keep your handset face-down (admittedly this probably doesn't apply to that many people), you'll appreciate that this feature carries over to the power button on the G2's backside. We didn't see any accidental power-ups or volume adjustments in our brief hands-on time today, which is encouraging. The other benefit of having slightly curved volume and power buttons is that they're easy to find by feel -- we didn't have trouble locating them without flipping the phone over, but not feeling along the edges for those keys will definitely take some getting used to. Moving the buttons to the back also allows for thinner bezels, and indeed, LG's slimmed these down compared to previous models. The top and bottom bezels measure 9.6mm and 12.9mm, respectively, while the sides are just 2.85mm. The 5.2-inch, Full HD panel is simply gorgeous; colors are vibrant, but not oversaturated, and IPS technology allows for great viewing angles and good glare resistance. At 450 nits, it's also impressively bright. Apart from the unique rear button placement, the G2's design isn't a dramatic departure from the Optimus G and G Pro. It will be available in both black and white, with both options sporting a subtle crosshatch pattern on the back. You'll find the 2.1MP front-facing camera in its standard place above the display, along with a thin speaker grille. The micro-USB port sits on the bottom, where you'll also find the headphone jack. The non-removable backing covers a 3,000mAh stepped battery, which LG says should net you about 1.2 days of use. Under the hood is a Snapdragon 800 processor accompanied by 2GB of RAM-- we can't draw too many conclusions about performance based on our brief usage, but we're expecting a fluid user experience and solid benchmark scores. Design aside, the G2's real hallmark features are on the software front; there are several new features baked in, some of which build upon nifty functionality already offered by competitors. Exhibit A is Knock On, which, like several Nokia Lumias, lets you turn on the display by tapping it twice. What the Lumia software doesn't allow for, however, is tapping twice to turn the screen off as well. There are several other helpful software additions introduced with the G2, including a Guest Mode feature and Text Link, but we'll save the full report for our review. 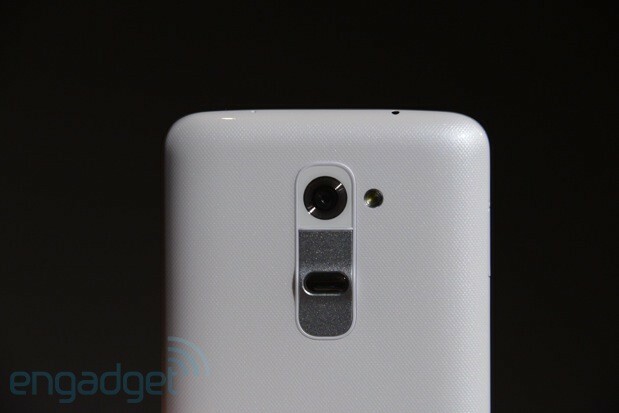 LG's really pushing the 13MP rear camera here, and the G2's module does look pretty impressive. It boasts optical image stabilization (OIS), which should allow for solid low-light performance and anti-shake. Based on our early tests, at least, the camera performs very well -- we'd say it's on par, if not superior, to the cameras in top-tier phones like the HTC One and Samsung Galaxy S 4. We can't wait to give this guy a closer look when review models become available. The other big upgrade is audio: with 24bit / 192KHz Hi-fi sound and FLAC / WAV support, the G2 is certainly a step up from the competition, most of which is limited to 16bit / 44.1KHz. And we could go on -- it's clear that LG wanted to make this product announcement an important one, and the multitude of new hardware and software features definitely make for a compelling flagship. Our first impressions were positive, and we walked out of today's event wanting more. Unfortunately for us (and you), we'll have to wait a few weeks for review units to become available. In the meantime, though, we have you covered with a video and gallery. Zach Honig and Myriam Joire contributed to this report.